We're back, and this time we're bringing more bartenders. With a new venue, comes new opportunities and this year we've got plenty. Welcome to DEF CON 23 and this year's "From Dusk til Con". 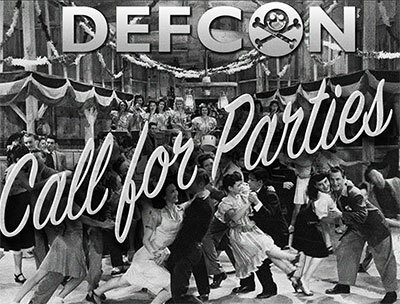 Enter the DEF CON 23 Call for Parties! We've got the space, and you've got free reign on what to do with it. In keeping with the format from last year, this doesn't mean we're looking for a dozen booze filled EDM fests. That's fine, but it can be more, or less, all it has to do, is bring it. Want to bring an arsenal of speakers and drop the bass until your face melts? Want to set up a Ninja Warrior style obstacle course to show off your sweet finger strength from all those late night hacking sessions? Want to set up tables and play Magic the Gathering until...until...well, whatever happens from playing Magic all night? DEF CON is going to be paying the cost for all bars this year as well. Calm down, not the cost of the booze, just the cost of the bartender. This will allow you to spend the money you would have spent on having a bartender on site for 4+ hours, on bubble machines, glow sticks, hiring a magician, or whatever instead. So start filling out the questions below and get them submitted. We'll pick the best ideas, and give them a space to turn their nerdtastic fantasies, into a reality, if only for a night. The Call for Parties...is open. What's a good phone number to reach you at? Answer the following in as much detail as you can. What's your event name going to be? Why do you want to have an event? What kind of event do you want to throw? How are you involved in the hacker community? Why should we pick your event over others? What music or entertainment do you want to have? What kind of decor will you set the room up in? Do you have any plans for giveaways, swag, or cool freebies? What are your plans for event regulation? Tell us anything else about yourself that you think we should know in considering your event application.